Appearance: Those used to the valentine-related heart of Western Culture may be suprised at the Egyptian concept of the heart. Theirs looks more like a vase with handles, and indeed many vases and jars were shaped like the hieroglyph in question. The heart of Egyptian iconography is a fairly faithful representation of a section of the heart of a sheep. The "handles" correspond with the connection of the veins and arteries to the organ. Meaning: The Egyptians early in their history realized the connection of the heart to the pulse. An ancient Egyptian medical treatise of the heart says that it "speaks in the vessels of all the members." It is not suprising then that they believed that the heart held the mind and soul of the individual. Another Egyptian author stated emphatically that "the actions of the arms, the movement of the legs, the motion of every other member is done according to the orders of the heart that has conceived them." It was sometimes said of the dead that their hearts had "departed" because it was believed that the heart was the center a man's life force. It was the heart which was weighed against the feather of truth in the hall of Ma'at during the diving judgement of the deceased. A heart unburdened with the weight of sin and corruption would balance with the feather and its possessor would enjoy the eternal afterlife. "O my heart which I had from my mother, O my heart which I had upon earth, do not rise up against me as a witness in the presence of the Lord of Things; do not speak against me concerning what I have done, do not bring up anything against me in the presence of the Great God, Lord of the West." Many "heart" scarabs were manufactured in Egypt. 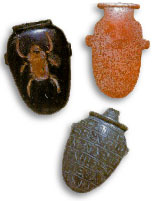 These scarabs were designed to be placed over the heart of the deceased. On one side a carving of a scarab was featured. On the other side Spell 30 was inscribed. During the embalming process, the Egyptians removed most of the internal organs from the body. However, they always left the heart inside the body. The brain was removed using a long bronze hook which was inserted up the nose. The Egyptians were not exactly sure what the brain did, although many believed that its job was to produce snot. According to the priests of Memphis, the god Ptah conceived of all things in his heart and brought them into being by speaking their names.